This necklace is made using suede cord in combination with satinique cord. The length can vary from about 15 to 18 inches with a center jeweled piece that adds 2 inches. It is done in beautifully warm colors of caramel, rust and a golden ivory. The jeweled piece is GORGEOUS! 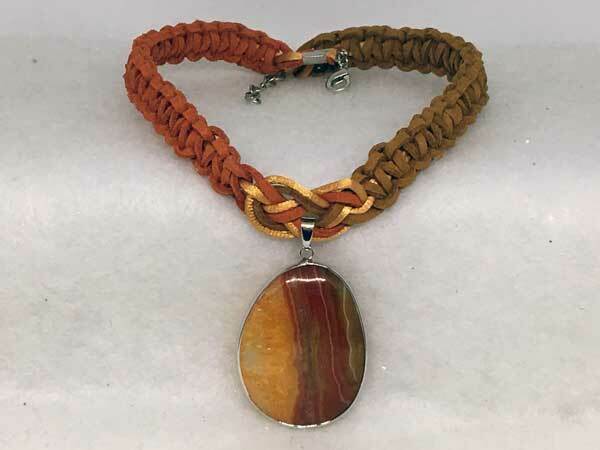 It is a semi-precious stone with lovely striations of color in colors that coordinate so perfectly with the cord that I have used. I LOVE this piece and would not normally have put this pendant at this price-point, but, because of a 40 percent off coupon, you win!